With the roll-out of one political doc after another this fall, it's easy to forget that documentarians can start out in art school as well as journalism school. In the early days of documentary filmmaking there was a great deal of crossover between photography and filmmaking. Henri Cartier-Bresson made documentaries; Paul Strand, his mentor in filmmaking, also was a photographer. The Film and Photo Leagues, formed in the 1930s in response to Fox Corporation's suppression of newsreels that documented Depression-era realities, included Strand , as well as Willard Van Dyke, Ralph Steiner and Leo Hurwitz, among other artists who engaged in both documentary film and photography. Weegee, whose name has become synonymous with photography, made a couple of films. And one of the art world's most respected photographers, Robert Frank, shocked the Rolling Stones by recording them in all their idiotic splendor with the groundbreaking rockumentary Cocksucker Blues (1973). Inspired by artists like Frank, Jem Cohen made the leap from documentary photographer to filmmaker in the early '90s and hasn't looked back. With familial roots going back to Sid Grossman of the New York Film and Photo League, Cohen grew up with photography as a part of his everyday life. Starting with an exploration of the work of Lewis Hine, Jacob Riis and other Depression-era photographers, Cohen soon graduated to a deep appreciation of Frank, as well as Helen Levitt and Bruce Davidson. With this pedigree it's no surprise that he was influenced more by the Maysles brothers than he was by Michael Moore. "When I watch something like Salesman ," says Cohen, "It's beautiful to look at, and that really adds to its power and its timelessness. It's stunning not because the Maysles are precious aesthetes, but because they are great cameramen shooting black-and-white film in strong situations, and because [editor] Charlotte Zwerin knew just what to do with their footage." When asked about being both a photographer and a filmmaker, Cohen replies that he isn't really a photographer. When pressed, he responds that he doesn't really consider himself a photographer anymore because he doesn't feel like he's strong enough as one. He first moved from photographs to slide shows, then to slide shows with music. The leap to filmmaking wasn't a huge one. "The tradition that I come out of has everything to do with walking around on the street waiting to come upon the unexpected, the visually exciting, and somehow capturing its essence," Cohen notes. This relentless search for images that convey complex meanings is clear in all of his work, from Lost Book Found (1996) to Instrument (1998)—his documentary portrait of the band Fugazi—to Benjamin Smoke (2000)—his collaboration with Peter Sillen on the final years and works of the musician Benjamin Smoke. While he still shoots photos, Cohen considers himself a filmmaker, with an emphasis on the word film. "I don't begrudge anyone for shooting video, but it doesn't have to look as bad as it generally does," he observes. "We would do well to stop and think about why even some of the simpler films have such power, and to consider what gets lost in these supposed technological improvements. There are some situations where it would now be absurd to shoot on film, but sometimes one can get more to the heart of the matter by shooting three minutes of Super-8 film, rather than seven hours of DV." 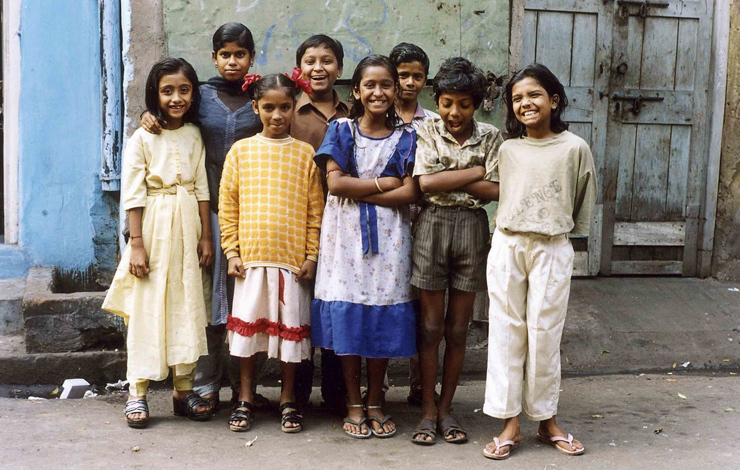 This idea is nowhere better illustrated than in Born into Brothels , in which young students wander the streets of Calcutta's slum, carefully framing and re-framing before taking their photos. Born into Brothels is a movie that is defined by film. In fact, it is as much about photography as it is about the children of Calcutta 's red light district. Director Zana Briski was photographing in this shadowy world for only a short time when she was struck by the wit, intelligence and moxie of the children living within its brothels. She acquired a number of point-and-shoot cameras and set out to teach these children about photography. With the help of co-director Ross Kauffman, she documented the process. When asked if she moved into filmmaking because she felt limited by the nature of photography, Briski responds, "I decided to make a film not because I found photography limiting, but because I instinctively felt that there was something important to document. There was a story to be told. For me photography and film work on different levels, although they can also work on the same level. Photography uses the language of dreams and can work on a much deeper, slower level. I don't see my photographs as romantic so much as capturing or revealing beauty that I found in one of the worst hells." As Briski taught photography, she learned about storytelling with film. "It was a very organic process," she recalls. "I learned alongside the kids. I began to understand that the camera could be an incredible tool for empowerment, self-reflection and transformation. The kids had great fun and at the same time they began to look at their lives and reflect upon them and then share their thoughts and vision in class." Unlike Cohen, she's ready to get back to the still camera. "I can't wait to get back to my own photography. It's been three years. I am not looking to make another film, but I wasn't looking to make the first one, either. I will be open to whatever I come across, and if it needs to be documented in film, I will make another film. I use the video camera in the same way I use the still camera. I like to be still and quiet and let things happen and change in front of me." Bruce Weber is a photographer whose adeptness at creating images filled with mystery and romanticism made him the perfect candidate to make a film about the legendary jazz trumpeter Chet Baker, Let's Get Lost (1988). He recently completed Letter to True, which is a very different film—a paean to his dogs, and to the affection, loyalty and unconditional love of animals. In addition to being a photographer and a filmmaker, Weber is a publisher of photography books. All of his films share a deep connection with the art of photography book-making. When asked about this connection he maintains, "I always felt that a film, like one of Ingmar Bergman's films, was like turning the pages of a fictional diary. It has his new wife, his girlfriend, the woman who will be his new girlfriend. Watching a film is like turning the pages of a book for me. "I started out in life as a photographer," Weber continues. "And filmmaking was an extension of my photography. When I first started in films I was making a commercial for Ralph Lauren and my cameraman was Nestor Almendros. Nestor was taking pictures all the time around the set on our prep day. People kept asking, 'Why is he taking all of these pictures?' I remember saying, 'He wants to connect to the light and the images; he wants to dive into the pool.'" For Weber, there is little differentiation between filmmaking and image-making.
" Oftentimes between takes, or setting up, on the set of a documentary, I'll dive in and I'll just start taking photos and the film just grows from those pictures. Yet when I started making films like Broken Noses , people would say to me, 'You can't make a film like you take pictures.' Today we're so obsessed with the camera moving so much, and sometimes it's nice to have it sit still." When asked whether or not he's influenced more by photographers and photography books than by other filmmakers, Weber insists that he's not. He cites early Italian cinema and American films of the 1940s and '50s that have a deep connection to photography. He does, however, recall a funny story about a photography bookstore: "When I used to go to a Photographers Place bookstore, I would say, 'Let me see that old Imogen Cunningham book in the glass case.' And they'd say, 'If you can't afford it, we're not going to show it to you.' I wanted to make films that explore those old books that most bookstores won't show you because you can't afford them." For famed photographer Neil Liefer, who has shot everyone from famed boxer Muhammad Ali to former New York Mayor Ed Koch and recently started shooting a documentary about sports writer Frank DeFord, the difference between photography and filmmaking is very limited. "I try to do the same thing that works for me as a still photographer as when I'm shooting a documentary," he notes. "With photography I arrange the photos to tell a story with a beginning, a middle and an end." As the aforementioned filmmakers can attest, it's clear that studying a little photography can only do filmmakers a world of good in pushing the aesthetic boundaries of documentary filmmaking. Michael Galinsky is a photographer and filmmaker based in Brooklyn, NY.